Every year in late summer and early fall, Sonoma County residents face the same dilemma – what to do with all the apples? There are only so many pies, tarts, cakes and apple kimchi that can be made! And fresh apples, especially the hallowed Gravenstein, only last a few weeks at most. Luckily, Slow Food Russian River has come up with an alternative way to make the most of our region’s “other” fruit. 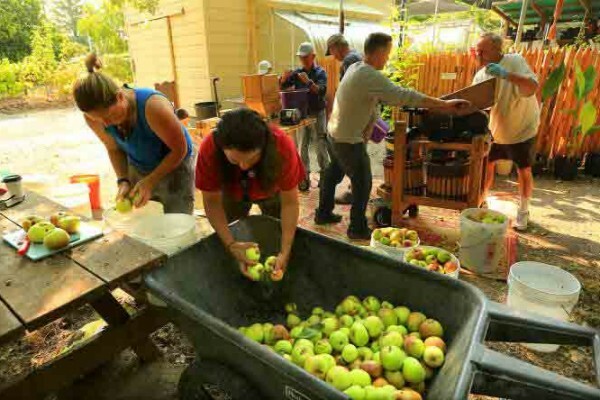 For the second year in a row, they are providing a free community apple press at the Luther Burbank Gold Ridge Experiment Farm in Sebastopol. “We love the wine produced in Sonoma County,” says Slow Food volunteer Bob Burke, “but we would really like to see the apple growers stay in business and earn a decent living.” Burke had the idea for the community press after his German-born wife told him about the community ovens in her hometown. 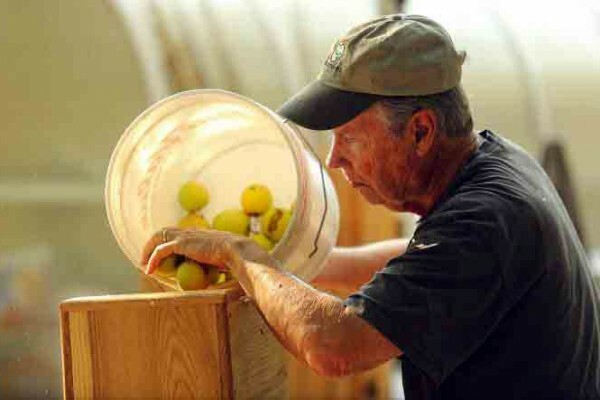 He arranged for two motorized wooden apple presses at the Gold Ridge Farm for public use Saturdays and Sundays through Oct. 31. 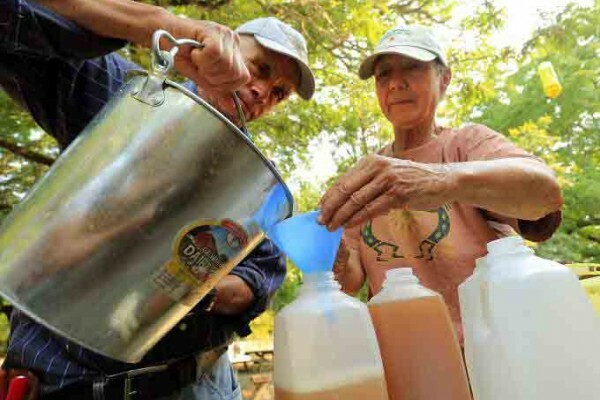 People are invited to buy apples from local growers or harvest their own and use the press to make juice that can be enjoyed fresh, frozen or fermented into cider. 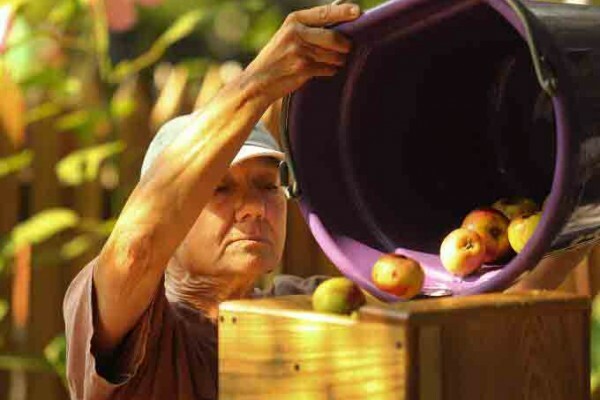 This project is part of Slow Food’s 12-year initiative to build demand for Sonoma County’s apples and reduce the amount of fruit rotting in the county’s iconic orchards. 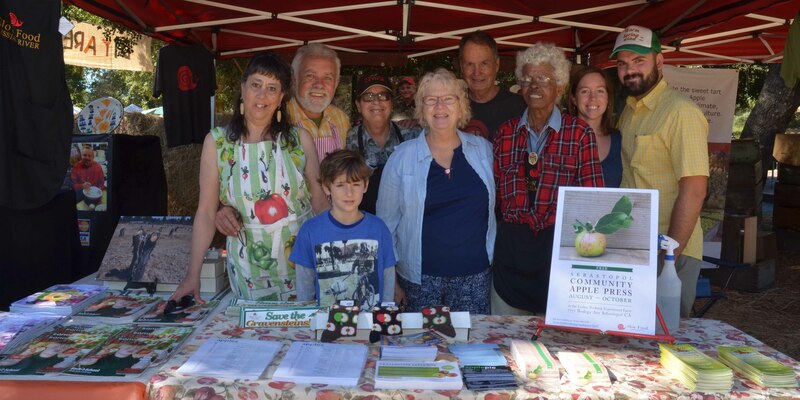 As Burke explains, one of Slow Food Russian River’s founding members, Paula Shatkin, conceived the idea to rebuild awareness for local apples while driving through the county 15 years ago. She noticed that many of the old apple orchards were being plowed under to make way for grapes. Furthermore, Shatkin and Slow Food encouraged the major apple growers in the county to work together and, eventually, transition to organic growing practices. 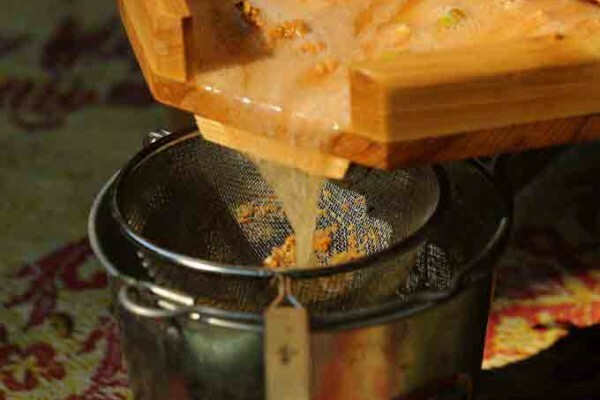 Since then, Slow Food’s Apple Core project has not only made apple presses available to the public, but also brought more customers to growers. Local restaurants now regularly feature Gravensteins on their menus, and over 25 local shops, libraries and the Sonoma County Airport all buy wholesale apples and offer them free to their patrons. Burke says that after 10 years of diligently working to support the Gravenstein and other local apples, growers are noticing a difference in demand. The public is taking note of this special fruit. On an unusually hot Saturday recently, Burke and his fellow volunteers joined Sebastopol Mayor Patrick Slater, Vice Mayor Sarah Glade Gurney, the Farm Committee of West Sonoma County Historical Society and a parade of apple-toting residents to officially open the pressing season. 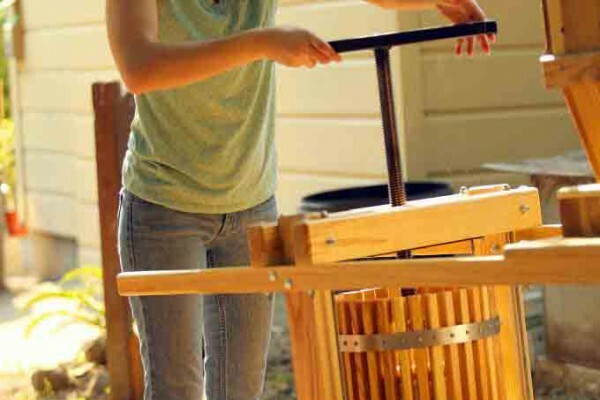 Slow Food purchased one of the customized presses from a specialty press-builder in Oregon for $1,600, thanks to a $4,500 Community Benefit grant from the City of Sebastopol. Another press came from Tilted Shed Ciderworks in Windsor, one of many local, craft cider makers who share Slow Food’s goal to build demand for heirloom Gravensteins and other antique varieties. 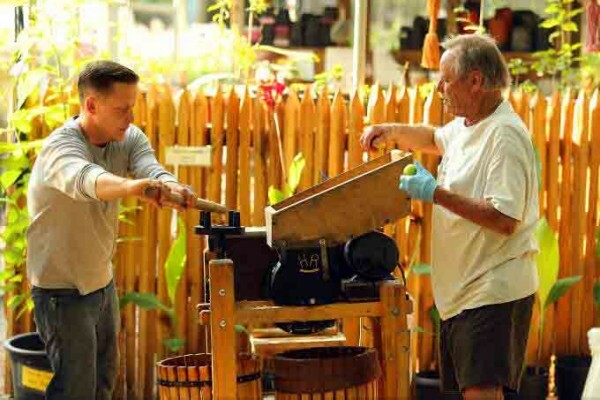 Volunteer Russ Franco cranked the metal arm of the press, and the fragrant mahogany-colored juice flowed into a stainless-steel bucket. Russ and his wife, Laydean, have nine apple trees on their property in Bodega. Russ says he used to dread apple season because there was never enough time to use all of their apples. The couple’s self-proclaimed “neuroses” about wasting fruit led them to search for a press last year, only to find prohibitively expensive options ($50/day to rent). They discovered the free press through word-of-mouth and, as Russ said, “it changed everything.” Like a lot of people who press apples, the Francos are perfecting their apple-cider recipe and say that pressing most of their 2,500-pound yearly harvest has eliminated 75 percent of their apple-processing work. And the press isn’t only for apples. Retired Sonoma State University professor Philip Beard arrived at the Gold Ridge Farm with a wheelbarrow of apples and Bartlett pears from his property in Santa Rosa. The pears, which have to be a specific ripeness for pressing, were tossed into the grinder like the apples. The fruit was crushed by a wooden dowel studded with screws and then pressed into juice. The leftover pumice is composted at the Gold Ridge Farm or picked up by local farmers and ranchers. 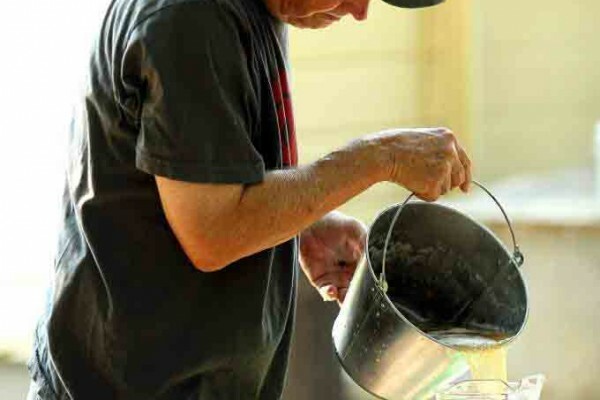 While Beard used to give much of his fruit to a local food bank or to his wife to bake into pies, he now takes home about four five-gallon carboys’ worth of juice to make cider which “is a big hit” with his friends and family. 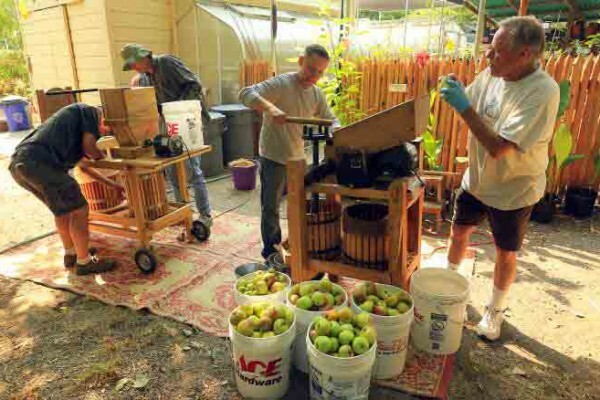 The press is helping to build awareness for Sonoma County apples for locals as well as out-of-towners. Megan Church and her boyfriend, Trevor Long, drove to Sebastopol from San Francisco. They ditched their motorcycle for a car to carry a bushel of Gravensteins from Marshall Farm in Guerneville to the press in Sebastopol and made about two gallons of juice to freeze and share with their friends. Aside from being a “cool thing to do as a couple,” Church and Long reflected the modern foodie interest that Slow Food is banking on to secure the future of heirloom fruit. Slow Food Russian River suggests making a reservation to use the presses. Click here to make a reservation. 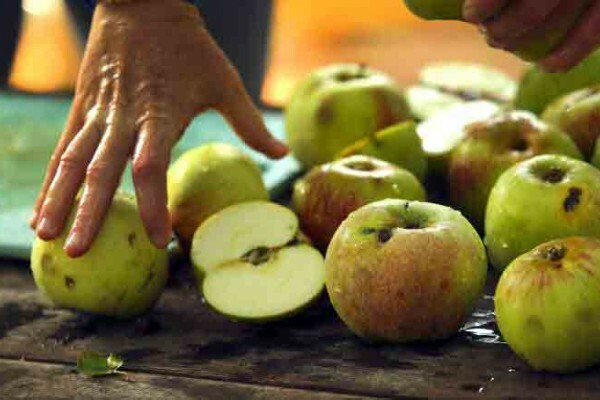 You can also find a map of apple growers, u-picks, apple artisans and cider makers at slowfoodrr.org.